David Roberts, a fomer world-class mountaineer and frequent contributor to The Active Times, knows the history of expeditionary-style exploration as well as any author alive. Not only has he chronicled the triumphs, failures, and near-misses of Messner, Mallory and Weissner and dozens of other legendary adventurers—he wrote Great Exploration Hoaxes, the definitive account of the frauds and egomaniacs who tried to fake their way to fame. 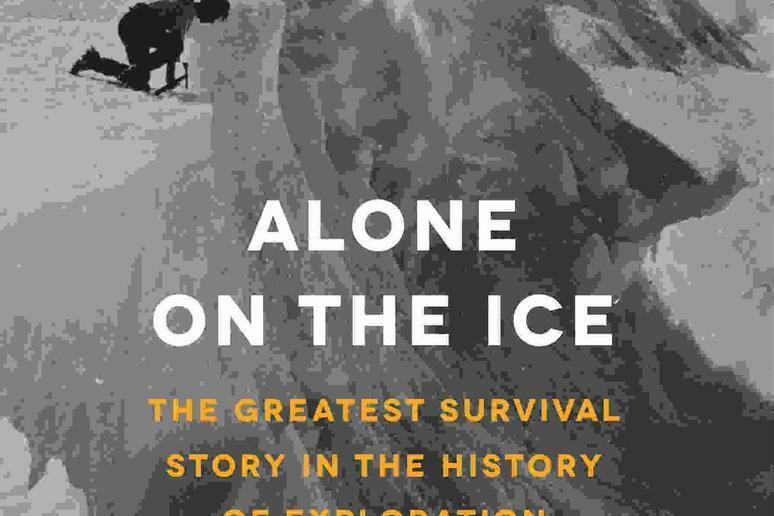 So when Roberts' latest book, Alone On The Ice, carries the subtitle "The Greatest Survival Story in the History of Exploration," you can be certain that it's a legitimate and hair-raising tale. Adversity, deprivation, suffering, ingenuity, courage? Check, check, check, check, check. The now-obscure story of Douglas Mawson and the Australasian Antarctic Expedition circa 1913 lives up to its "greatist" billing in spades. In fact, the story of his desperate 100-mile journey, alone and near starvation, to return to his frozen Antarctic base camp is the kind of extreme survival story that few of us can comprehend, let alone relate to. How many of us, dangling over the abyss of a collapsed ice bridge, would summon the will to pull ourselves to safety by remembering an especially stirring line of poetry? That era of heroic exploration, which reached its height in the years before and during World War I, has indeed passed. Luckily, Roberts has brought it back to life—and talked with us about Mawson in a recent interview. Q. How did you get onto the Mawson story? A. I’d known the basic outlines for some thirty years, ever since I read Lennard Bickel’s Mawson’s Will (1977), at the time the only version readily available in the U. S. or the U. K. But Bickel’s book focuses only on the three-man survival story, not on the whole remarkable 31-man expedition, and Bickel unfortunately invents wooden dialogue and facile introspective passages. When I came upon Mawson’s own account of the expedition, The Home of the Blizzard, my interest really sparked. It was majestic and understated. But the actual diaries of the men—Mawson’s own, published posthumously, and the many unpublished journals in Australian libraries—give the saga the interpersonal richness it deserves. Q. Why aren’t Mawson and the story of the Australasian Antarctic Expedition (AEE: 1911-1914) better known? A. Three reasons, I think. One, he was Australian, and in those days the sheer distance from the States and the U.K. still mattered in getting world attention. Two, he was completely uninterested in going to the South Pole. What he wanted to do instead was explore a 2,000-mile swath of terra incognita directly south of Australia, and to carry out rigorous science. Three, he emerged from Antarctica just as the news of Scott’s tragic loss of the polar race to Amundsen and the deaths of the five in Scott’s polar party electrified the world—eclipsing Mawson’s equally stunning story. Q. Why did Sir Edmund Hillary call Mawson’s ordeal “the greatest survival story in the history of exploration”? A. Well, there’s simply nothing like it. Every English schoolboy knows about Shackleton’s great Endurance story (1914-1917), but that was a group effort. Mawson’s last 100-mile march back to the hut, almost out of food, utterly weakened by the ordeal, his hair falling out, sores all over his body, the soles of his feet becoming detached from the raw skin underneath, falling into crevasses that he miraculously escaped—was a solo journey against nearly impossible odds. Q. The story of the second wintering over could almost make for a book of its own, couldn’t it? A. By getting back to the hut on February 8, 1913, three weeks after his own deadline of January 15, he missed catching the relief ship by a mere five hours. That condemned him and the six men left to search for him to a second winter at Cape Denison, now proven to be the windiest place on Earth at sea level. Still, at first the men took comfort in the fact that they had successfully established radio contact with Australia—another Antarctic first. But the radio operator, Sidney Jeffryes, went insane and not only refused to broadcast or receive, but kept the other men from using the radio. Jeffryes alternated throughout the winter between the conviction that the other six men were going to murder him and the resolve to kill them first. That second winter turned into a nightmare, with a man appointed day and night, month after month, to stand guard over Jeffryes. It’s a testament to Mawson’s leadership that an actual murder didn’t take place—but the pyschological ordeal was unfathomable. Q. Some of the supporting cast—particularly Frank Wild and Frank Hurley—were pretty extraordinary in their pown right, weren’t they? A. I could have written a book three times as long if I’d gone in depth into the characters of many of the supporting cast. They were nearly all stalwart individuals with fascinating traits and temperaments. But let’s focus on Wild and Hurley. Frank Wild deserves to be known as the equal of the “Big Four” (Amundsen, Scott, Shackleton, Mawson). He was the only man to go on five different expeditions during the Heroic Age. On the AAE, he led the eight-man team operating out of the Western Base, 1,500 miles from Mawson’s Main Base, cut off from all contact, utterly dependent on the relief ship that almost arrived too late. Wild kept morale high, despite the men having had to build the team’s hut on a moving ice shelf that kept calving into the ocean. Q. What is it about the Heroic Age of Antarctic Exploration (1897-1917) that seems to have no parallel today? Q. Can you compare Mawson as a leader to Scott, Shackleton, and Amundsen? A. Like Amundsen and Shackleton, but unlike Scott, Mawson was a truly democratic leader, sharing all the toil with his men and consulting them about major decisions. Mawson was a workaholic who detested idleness, a characteristic that didn’t sit well with a few of his men, but in the end, his vigilance kept all the men alive—except for his poor companions on the Far Eastern Journey, Belgrave Ninnis and Xavier Mertz. Late in life, all the surviving members of the AAE wrote to Mawson saying that the AAE was the greatest event of their lives. Not even Shackleton or Amundsen could boast such retrospective loyalty. Q. Why should we read Alone on the Ice? A. To paraphrase Mallory, because they were there. Because you’ve probably never known much about the AAE. And because there’s no other adventure story quite like it.